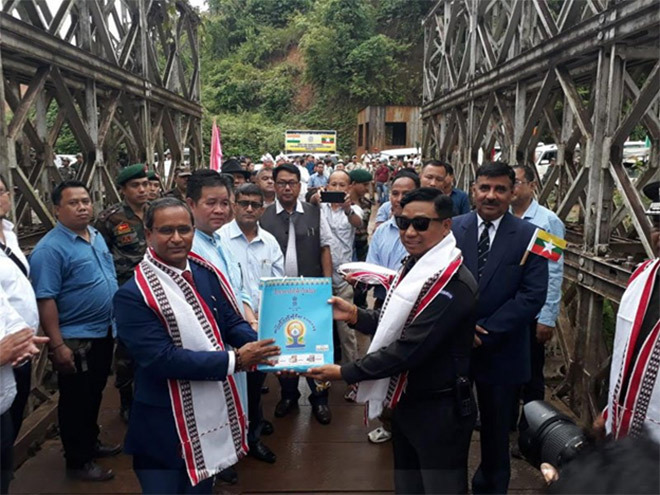 Under this agreement, BP holders can travel up to 16 miles, Imphal city and in Myanmar, the visitors can travel up to Falam district, 16 miles from the border. The opening of the border entry posts will facilitate the travel of passport holders with valid passports and valid visas from both countries and they can pass the border from these two border entry ports. Myanmar people who have a valid passport, valid visa issued by the Indian embassy in Myanmar or E-Visa can travel to India, and Indian nationals and foreign nationals who have a valid passport and a valid visa or E-visa issued by Myanmar embassies in the country concerned can travel to Myanmar through these two new border entry ports on the India-Myanmar border. The opening ceremony held in Tamu was attended by Chin State Chief Minister Salai Lian Luai, Chin State government Security and Border Affairs Minister Col. Han Win Aung, Chin State Auditor General Larr Tin Man, House of Nationalities MP from Chin State Za Hle Thang and Permanent Secretary of Labour, Immigration and Population and from Indian side, Mizoram State government Minister of Commerce and Industry Shri Pu H. Rohluna, India Consul General in Myanmar Mr. D. Kumar Praveen and Indian Consul in Myanmar Mr. Rajesh Kumar.